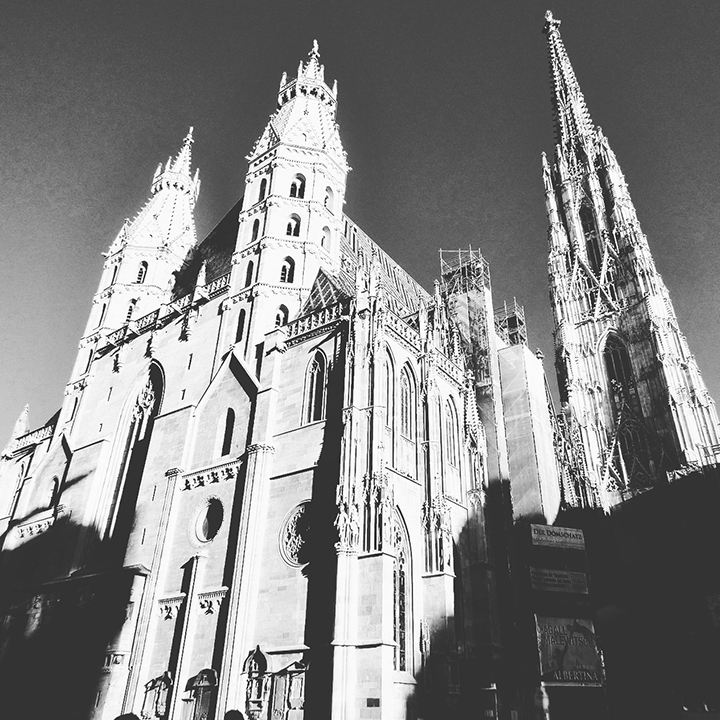 After touring the Melk Abbey we drove a short ways to Vienna. This is the first time we've returned to a city and stayed overnight because there are so many other places we want to go still. 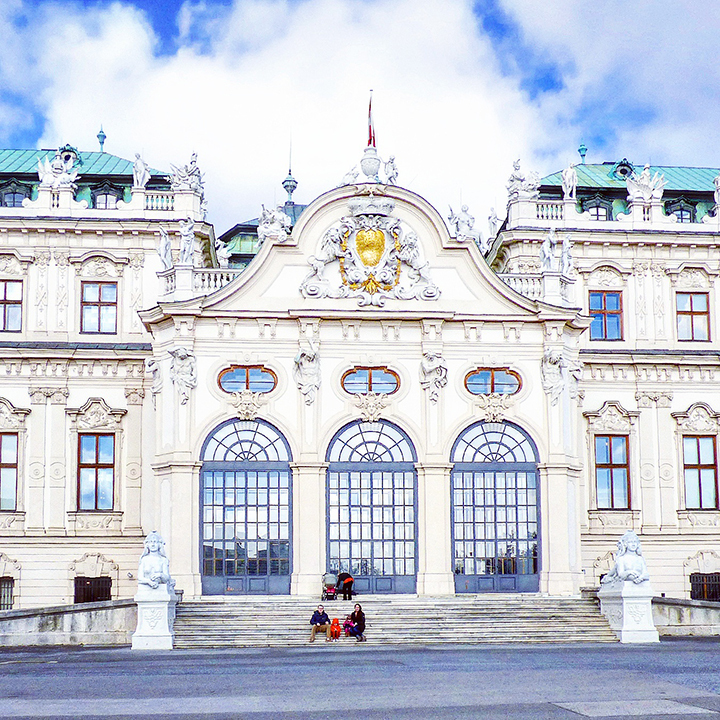 The reason we returned to Vienna is because when we were here in 2013 we planned to go to the Schönbrunn Palace on our last morning - we were in the parking lot ready to go in and everything. But it was raining and cold and still decorated for Christmas (which, don't get me wrong, I LOVE Christmas, but I also love seeing places in their 'everyday' state), so we decided to come back. Afterall, Rick Steves says the Schönbrunn is the #2 palace in Europe! Speak of the devil! We drove right by the palace as we were on the way to our hotel. See ya soon Schönbrunn. We were hungry for dinner but we didn't want to head out into the unknown and find a restaurant so Chris went down to the front desk and asked about places that deliver. They showed him a cool website that had all the places that would bring us food so we placed an online order. 30 minutes later came a knock on our hotel room door and our food was there! So convenient! We got some delicious pepperoni and pineapple pizza, spaghetti bolognese, and then added some breadsticks so we met the minimum free delivery amount. The next day our first stop was the Schönbrunn Palace, which already got its own post. After that lovely morning our next stop was the Belvedere Palace. The elegant palace of Prince Eugene of Savoy is now the home to an excellent art collection. The views over the city and gardens were beautiful. The still-much-appreciated conqueror of the Ottomans, Eugene, a Frenchman, was considered too short and too ugly to be in the service of Louis XIV so he offered his services to the Habsburgs. While he was indeed short and ugly, he became the greatest military genius of his age, the savior of Austria, and the toast of Viennese society. When you conquer cities, as Eugene did, you get really rich. With his wealth he built this palace complex built to rival Schönbrunn. Stroller selfie of our family in front of the Belvedere Palace. Chris had to book it to make it in the picture before the timer went off! 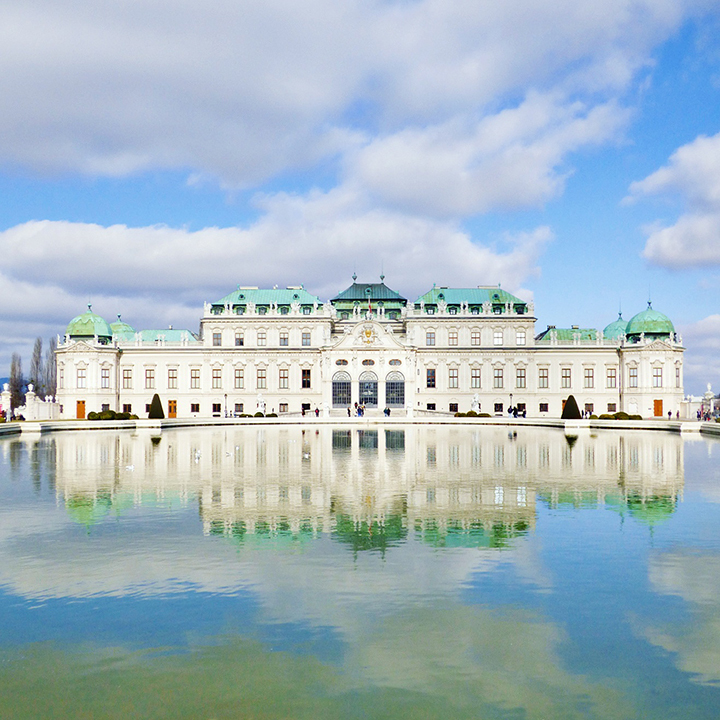 Since Eugene had no heirs, the state got his property when he died and Emperor Josef II established the Belvedere as Austria's first great public art gallery. Today you can tour Eugene's lavish palace, see sweeping views of the gardens and the Vienna skyline, and enjoy world-class art starring Gustav Klimt, French Impressionism, and a grab bag of 19th and 20th century artists. While Vienna's other art museums and collections show off works by masters from around Europe, the Belvedere has the city's best collection of homegrown artists. We went back to the hotel to rest then we went back into the heart of town and enjoyed wandering the sights and end at the little wurst stand that has the best currywurst in the world for dinner. We hopped on the subway and off we went. Fox & Jane like riding on the metro. We got off right at the foot of St. Stephen's cathedral. We ducked inside to admire the gothic nave. Back out on the street we moseyed, enjoying the ambiance, and the clear skies. Awesome art nouveau building. Vienna is an art nouveau wonderland. The world-famous opera house. || The state theater. 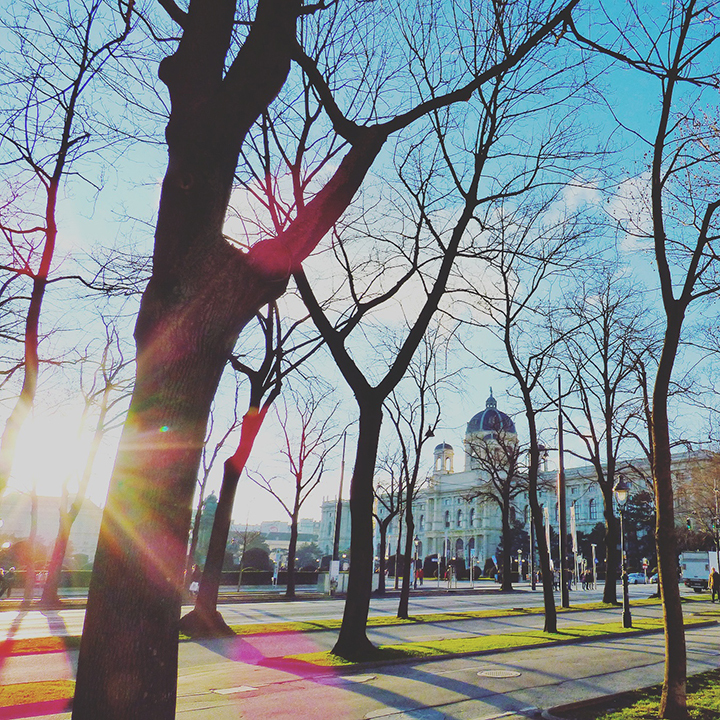 Looking through the trees towards the Kunsthistorisches Museum. Texture. 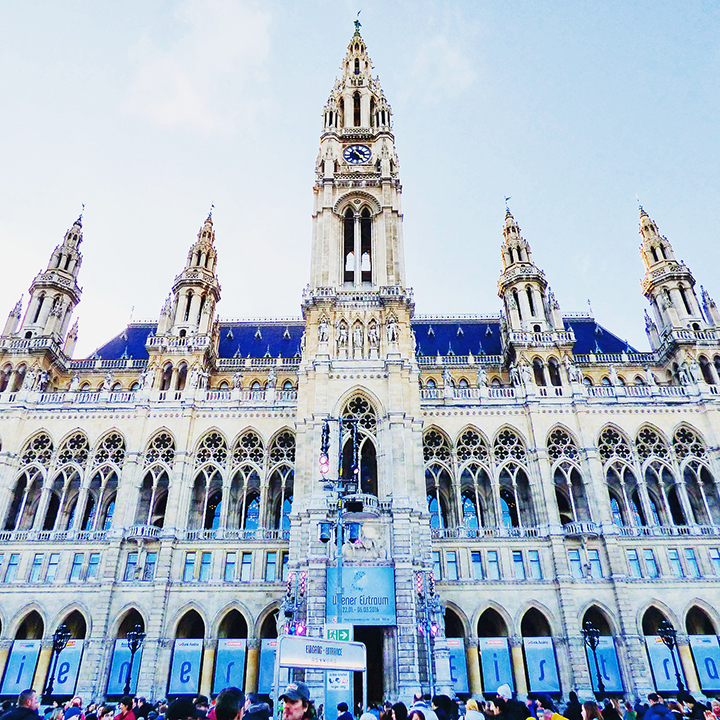 Vienna's lovely Rathaus. In front of the city hall was a huge ice-skating festival with rinks and ice paths everywhere! I've never seen anything like it before. We walked back into the center from the Rathaus through the Volksgarten towards the Hofburg Palace. After sitting in the park for a while letting the kids run free, we headed back towards the opera house to get the currywurst we've been dreaming of since 2013. It was just as delicious as we remembered. We were enjoying ourselves so rather than hopping on the nearby metro we decided to take in the evening sights and walk a little more to the next metro. We strolled all the way down Kärtnerstrasse past Stephansplatz to Scwedenplatz and then took the metro back to our hotel. On our last morning before heading home we drove to the funky Kunst Haus museum and Hundertwasser Haus apartment complex. 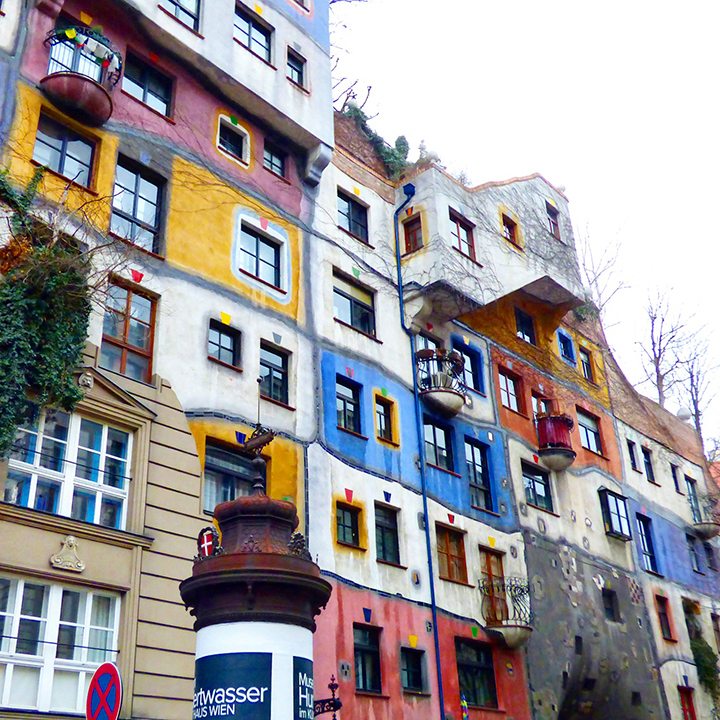 These two buildings are a hit with lovers of modern art and mix the work and philosophy of local painter Friedensreich Hundertwasser. So inspiring! Loveeeeeee these photos!!!! LOVING that peace symbol in front of the Kunst Haus museum!! And loving Fox's Olaf hug!!!! Adorable!!!!!!!!!!!! 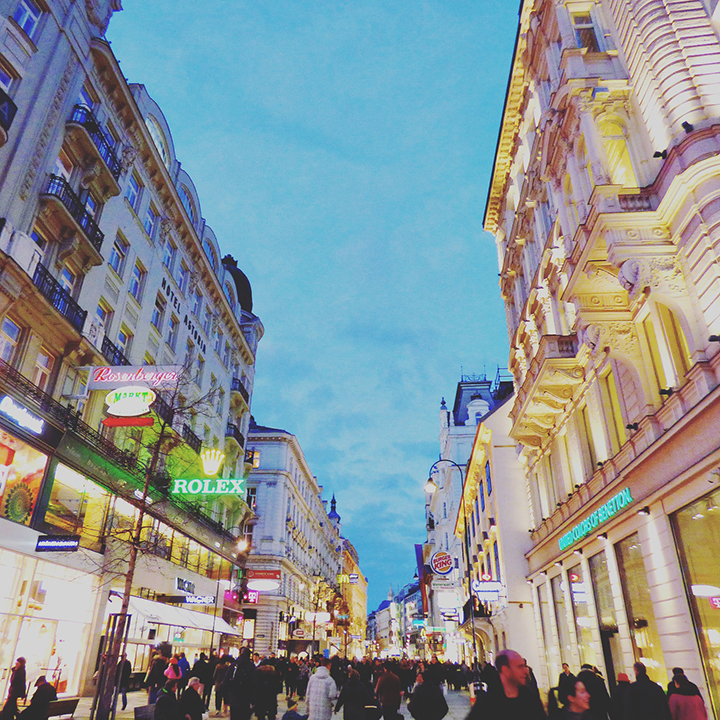 It was fun walking around Vienna again. And that currywurst, could it be any more delicious?! ?